“September Song” was written for the Broadway musical Knickerbocker Holiday, which opened in 1938 starring Walter Huston. 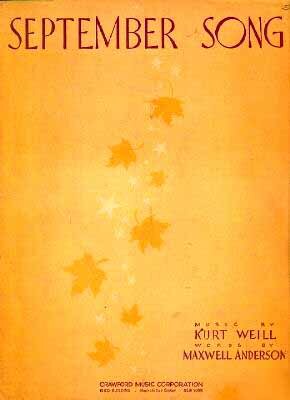 Huston had requested to have a solo song in the production and so Weill and Anderson wrote “September Song” with careful attention to Huston’s limited singing skills. In spite of a limited range, the poignant quality of the lyrics and the charming tune make for a quite pleasant song that has found great popularity among singers, including Bing Crosby, Frank Sinatra and even Lou Reed. September Song was recorded on November 11, 1959 and was released in 1960 on the album To My Wonderful One. It was arranged by Frank DeVol.